For the marinade, mix together olive oil, sumac, sugar, cumin, thyme, lemon juice, paprika powder, and tomato paste in a bowl. Pour marinade into freezer bags and place the pork in as well. Make sure that the pork is coated completely in the marinade and seal the bags. Leave to marinate in the fridge for approx. 1 hr. Wash potatoes thoroughly, and together with sea salt, add them to a pot. Fill the pot with water until the potatoes are fully submerged. Cover, and cook over medium heat for approx. 25 min. Pre-heat oven to 180°C/350°F. For the mojo verde, wash and halve bell pepper and chili. Core the bell pepper and lay it onto a baking sheet. Bake in oven for approx. 25 min. Remove from oven, let cool, and remove the skin. Meanwhile chop chili with seeds. Pick parsley leaves from stems and finely chop cilantro with stems and parsley. Add bell pepper, chili, garlic, cumin, parsley, cilantro, salt, and olive oil to a liquid measuring cup and purée until smooth. Season with lime juice, salt, pepper, and sugar to taste. Transfer to a small bowl and set aside. Pour out the water in the pot until there is still a bit left. Without the lid, heat the potatoes over medium-low heat until the water evaporates and shake the pot from time to time. This is to ensure that the potatoes get the typical wrinkled salt crust. Take the meat out of the marinade and gently pat dry. Heat up a nonstick pan over high heat and sear the pork for approx. 3 – 4 min., flip over, and fry for approx. 2 – 3 min. more. 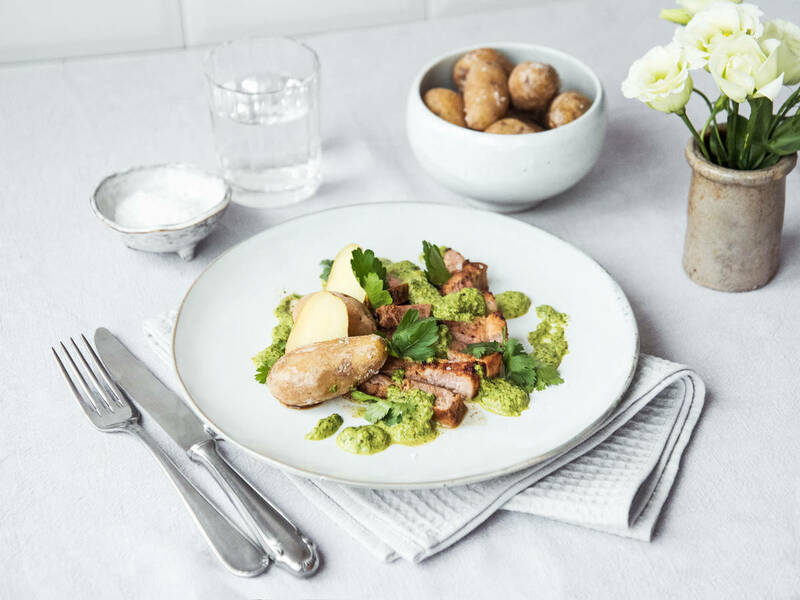 Place the pork and potatoes onto a plate, serve with mojo verde and enjoy!